RHINO metal barns are prefabricated as kits with factory-precise components for quick and easy on-site barn construction. All the primary framing pieces are cut, welded, and drilled for fast bolt-together construction. The remaining framing components and roof and wall panels are applied with self-drilling screws. Many do-it-yourselfers assemble and erect the framing themselves with the help of a few friends, just like an old-fashioned barn raising. 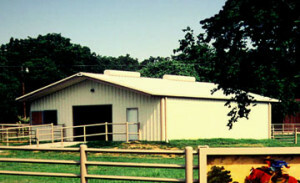 RHINO steel barn kits and agricultural buildings work well for many farming and ranching applications, including dairy barns, hay barns and sheds, heavy equipment and commodity storage, horse stables, riding arenas, grain storage, workshops, and more. They protect your livestock and equipment assets from the elements, while providing decades of trouble-free, water-tight service. A RHINO steel barn is fire resistant, lightning resistant, strong, durable, termite resistant, waterproof, and practically maintenance free. RHINO framing is guaranteed to meet or exceed all local building codes and loads for the life of the structure. 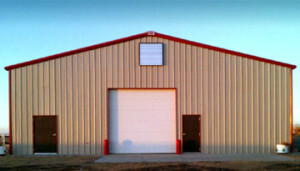 RHINO steel barns can be built with a variety of door and window options, including large overhead doors to accommodate heavy duty farming equipment. An assortment of natural lighting options are available, such as high-strength sidewall lighting and skylights. Although most people choose our durable and attractive steel panels and trim to finish the exterior of their steel-framed barns, stone, brick, stucco, wood, or other finishing materials can be added to achieve a variety of exterior styles. With so many standard selections and extras available from RHINO, your steel barn can be customized to fit your unique needs and preferences. See our Options Page for more information. The interior of your metal barn kit can also be modified with a choice three standard liner panels and partitions styles, available in a variety of attractive colors. You may want to adapt your barn with partitions for horse stables or dairy cow stalls, a separate tack and equipment room, or even an insulated office area. In fact, the entire structure can be insulated if desired for years of energy-efficient, climate-controlled comfort. RHINO steel barns promise space and lots of it. The clearspan capabilities of our steel buildings make them ideal for all farming and ranching structures. Standard buildings can span up to 150’ without any confining interior columns, but custom quotes can provide building spans of 200’ or more. Prefabricated barns can be up to 40’ high on a standard package, or can be designed to be even taller with a custom quote. Call a friendly RHINO steel framing specialist today and let their experience guide you in selecting the perfect building package for your new barn or rural storage structure. Call us at 940.383.9566 to learn about prefabricated barns. Share the post "Metal Barns"